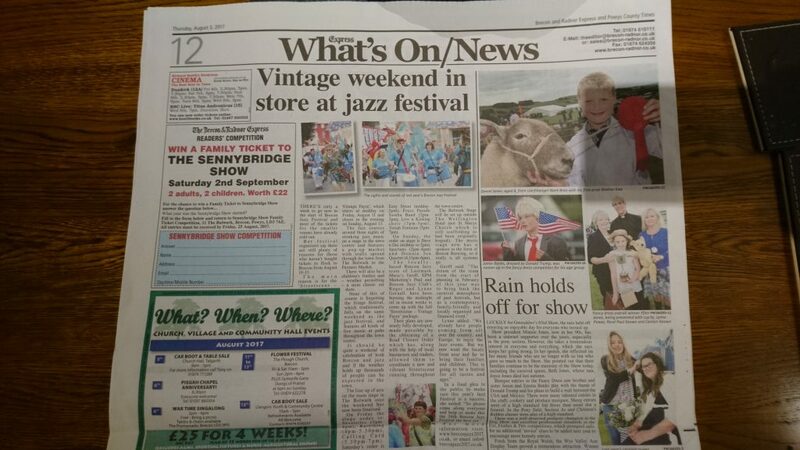 Not many festivals can boast reaching their 34th year, but Brecon Jazz can! It’s been an incredible ride from the Jazz festival’s first couple of years in the early 1980’s. There have been a few interesting times along the way, but the 34th year is ready to be a big weekend. The Festival is going back to its roots and focusing on what makes the festival so special..the people of Brecon. Yes, YOU! This year’s theme has been In Brecon, by Brecon, for Brecon and this is why the festival is returning to its roots by closing the town centre to traffic for the whole weekend. This way, families will have lots to do. So if you mix together some great Jazz events, fringe and the street scene over the weekend, you have something for everyone. There’s been great support from the town with Specsavers in Brecon supporting the Dave Brubeck event, Brecon Brewing sponsoring the main stage in the Bulwark and lots of valuable help and support from The Wellington Hotel, The Castle Hotel, Mitchell Meredith, Brecon Town Council. So it’s a real Brecon family affair. The festival opens this Friday 11th August at 8pm, with a ‘Slice of Jazz Big Band’ at the Castle Hotel. The lead TENOR SAX PLAYER is Martha Skilton, who is a renowned and in demand jazz musician, part of the team at BLACK MOUNTAINS jazz. Lynne Gornall from the Brecon Jazz Festival team said, “Martha played in the lineup at Brecon Jazz Festival last year and also at Brecon Jazz Club. We’re delighted she’ll be in full sax ‘voice’ for our opening concert”. It’s all about showcasing great female jazz talent throughout the Festival, and starting on the Friday, as the free live stage opens with the SAXALETTES – four women, four great sax players at the Bulwark, Friday 11th August at 2pm. So even though most of the Jazz concerts are virtually all sold out, there is still lots to do in the town over the weekend and excellent music to be heard on the free live stage. live, free music in the streets, kids’ activities and fun stuff, a Jazz exhibition in the library and Guildhall and the legendary Brecon Farmers Market. Why would you want to be anywhere else? Good write up in the Brecon and Radnor today – the excitement is building!! 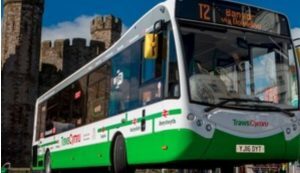 The pilot, which will apply to all buses on the extensive TrawsCymru network, will begin on Saturday and run every weekend until at least May 2018. Do B&R readers know anyone from these places? Because these are just some of the places, the towns and cities from all over the UK, of people who love Brecon. They are leaving their lovely homes for a weekend in August. Wonder why? 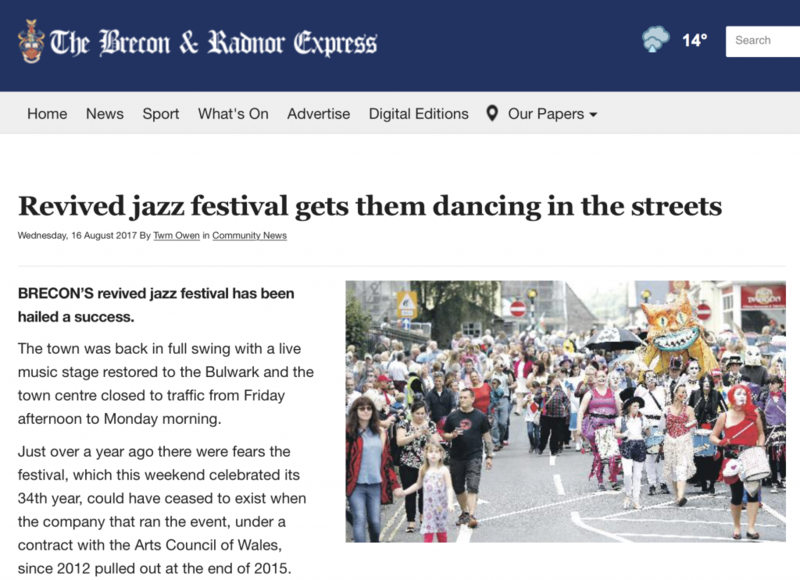 They’re coming to Brecon for the Jazz Festival, now in its 34th year! Are you? No wonder they love Brecon. It’s the place, the spaces, the welcome, the music – the jazz! Maybe readers have friends coming too? Well our friends across the Welsh counties are very well represented too, travelling from many corners and routes into Brecon… we’ve sold tickets to them all! Aberystwyth – Carmarthen -– Oswestry – Denbigh – Swansea – Port Talbot – Llandrindod Wells – Pontypridd – Newport – Llangorse -Blackwood – Cardiff – Tredegar – Neath – Penarth – Talgarth – Raglan – Govilon – Sennybridge – Cwmbran – Mountain Ash – Llandysul – Abergavenny – Pontyclun – Abercynon – Hay-on-Wye – oh and of course, Brecon itself. We’ve even attracted some visitors from Europe. The Jazz Festival team will be ready to welcome everyone, with ‘STREETSCENE’ – music in the Bulwark, street traders and stalls, exhibition and information in the Guildhall, fun activities for little fans, and even a mini car show (weather permitting). Music will include jazz, blues, choirs, jive and swing. If you fancy a try yourself, join our ‘INSTANT JAZZ’ music and improvisation workshop with Rod Paton of LifeMusic on Friday (2-4pm in the Muse, £10). There are headline Concerts too – starting at the Castle Hotel on Friday and closing at the Wellington Hotel on Sunday… but hurry as the whole programme is almost all sold out. The locally-based Brecon Jazz team of Lastmark Music’s Geoff, EPM Marketing’s Paul and Brecon Jazz Club’s Roger and Lynne, have been burning the midnight oil for weeks now in order to develop the Streetscene – Vintage Fayre element of this years ‘Jazz’ along with the now confirmed and nearly sold-out, International jazz line-up. Their plans are now nearly fully developed, made possible by the obtaining of a Road Closure Order which has, along with the help of local businesses and traders, allowed us to coordinate a new and vibrant Streetscene. In Brecon, by Brecon and for Brecon. Geoff says, “the dream of the team from the start of planning in February of this year was to bring back the carnival atmosphere of past festivals, but as a contemporary, family-friendly and locally organised and financed event”. Lynne, Roger and Paul have commented that, “we already have people coming from all over the country, and Europe, to enjoy the Jazz events. But we now want the locals from near and far to bring their families and children. This is going to be a festival for all tastes and ages”. The team of Brecon Jazz Club, Lastmark Music Ltd and EPM Marketing are now finalizing planning for this the 34th ‘Brecon Jazz Festival’ weekend. We have secured road closure for the Festival weekend (our Streetscene) allowing us to recapture some of the atmosphere of past festivals with a main stage performance area in The Bulwark and a local performer’s stage outside Lloyds Bank. About Brecon. By Brecon. For Brecon. In order to achieve this we need the sponsorship of local traders and businesses. There have in the past been considerable sums in grants from Welsh Arts Council and local authorities etc. This year they have not been forthcoming…. ‘times of austerity etc.’ and so we have to ask for help from Brecon. Sponsor us to stage the Streetscene this year and share with us in the rewards it will bring to Brecon. Organisation of this year’s Brecon Jazz Festival 2017 is proceeding well and we now have a Street Closure Order in place to help make this year livelier and better. This closure order runs from midday Friday 11th to 6pm on Sunday 13th. As part of creating the Festival atmosphere we are planning to set up street performance stages with a range of varied local and new artistes and bands. There will be festival concerts and jazz events across the town, with great music and a few surprises. We will be staging events from Fri afternoon and early evening, Saturday afternoon and early evening and Sunday afternoon and Sunday evening. As part of our ‘Streetscene’ plan, we are working with local traders and business outlets to have stalls and outdoor food available. These stalls will help to fund some of the Festival activities this year. The BJF2017 team is also in discussion with a number of potential sponsors. We are delighted to announce, through Brecon Jazz Club, that Brecon Beacons National Parks are supporting us to begin work on a display of ‘BJF 34 years’ through the Sustainable Development Fund. This will celebrate the visual and musical heritage of the festival, and working with a number of local groups and artists. Hello everyone…hope you are enjoying the bank holiday! 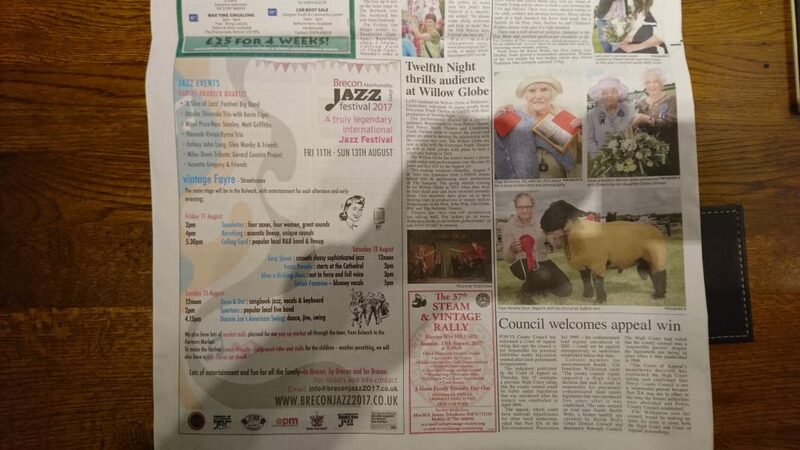 Only a few days to go till…well lots going on, but make a date with JAZZ this weekend. We are putting on three amazing musical lineups in Brecon to celebrate 34 years of the annual Jazz Festival – and to ‘welcome in’ the 2017 Festival year. There will be a full roads closure in August and lots on in the streets and in the venues. Music starts 7.30 with Cuban set from Los Despacitos, a six person lineup led by percussionist Diogo Caramello Gomes includes: jazz flute, drums, congas, keyboards, bass, voice – authentic sounds, uptempo, rhythms, a great start to the night. The programme continues with the Mike Chappell ‘Festival’ Trio – Mike on keyboards, with Erika Lyons double bass, and Romarna Campbell on drums – playing favourite standards and classic jazz. To close the evening and have you jiving, the ‘Room to Groove’ 7 piece swing band will take us through to bedtime, but we’ll be too excited to sleep, so dancing will be a good alternative! Aim to go home very happy around 11.30pm. Don’t forget that our partners, the Wellington Hotel, serves food all day and till around 9pm on the night. There will be a small exhibition at the event visualising some of the iconic moments and names of the past at ‘Brecon Jazz’. We are delighted to acknowledge funding from the Brecon Beacons National Park Sustainable Development Fund, and in its production, our association with Brecon Jazz 2017, Vaults Arts Studios, Brecknock Museum & Art Gallery. BJ2017: Lastmark Music, Brecon Jazz Club, epm Creative. We will also be announcing our exciting new idea for a Brecon Jazz Trail in the town over the next year. > BJ Club: Next @ Muse Arts Centre: Tues 13 June Alison Rayner Quintet 8pm. With thanks to all our poster sites in town incl. Nicholls, Vapour Den, Corracle Coffee, The Cafe, Tourist Info Centre, Wellington Hotel, Ty Helyg, Castle Hotel, Costa Coffee, Welsh Flavours, Bobbins, Pilgrims, Library, Guildhall, St Mary’s, Muse, Edwards News, Coffee One, Gegin Goch, Beacon Wholefoods, Canalbank Trust, Bethel Electric, Giglios, Premier Shop, Co-op, Morrisons Garage, Market Hall, Clarence, Brecon Music Live.